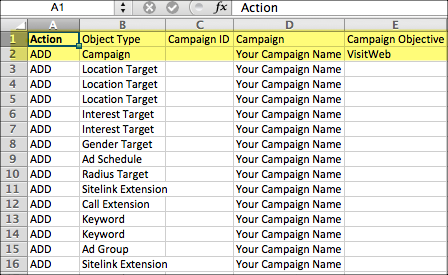 Use Native & Search bulk files to download and edit all the campaign data in your advertiser account. You can then simply edit the data in CSV format in an Excel spreadsheet. In the Native & Search user interface, you generate and download a bulk file and then use that file to edit the campaign data you downloaded, as well as to add new data. Once you’ve downloaded the bulk file, you’ll see that very row represents a single component. A specific ad, for example, is represented by one row, an additional ad by another row. Each object type has attributes you can edit. Certain attributes are unique to specific object types, however, as described in the table below. The Object Type is a mandatory field and required in every row of an uploaded file. Use this field to tell Native & Search what is the object you are describing in a given row. The Action field is mandatory and required in every row of an uploaded file. Use this field to indicate to Native & Search the action you would like to perform for a given row. The field accepts either Add, Update or Delete. In downloaded files the field is empty. If the Action field is blank, the row is ignored and not considered for any additions or updates. To ensure you have the most up-to-date column headers, you should export a correctly set-up campaign out of the UI and use that export as a template. For a complete list of available object types and actions for your bulk files, see Bulk Fields & Object Types. Bulk uploading for Native & Search is a faster alternative than manually creating each component in the UI. When you upload a bulk file, your changes are applied in the system and visible in the UI.